These are not only the most delicious chcolate brownies ever, they are the easiest brownies ever! Mmmmmm……send me your address and I’ll send you a piece. 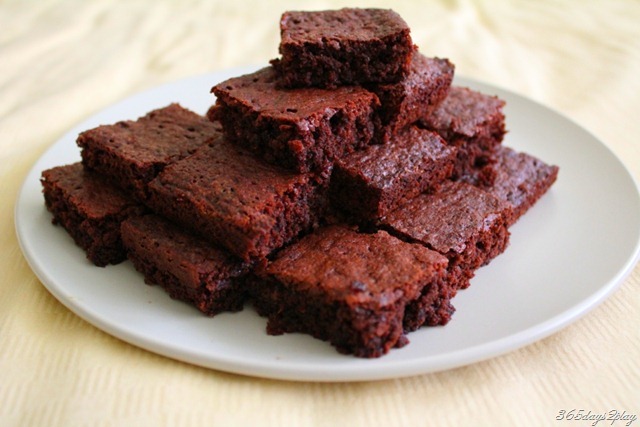 Brownies are literally the easiest things to bake! Throw all your ingredients into a mixing bowl. Whisk away. 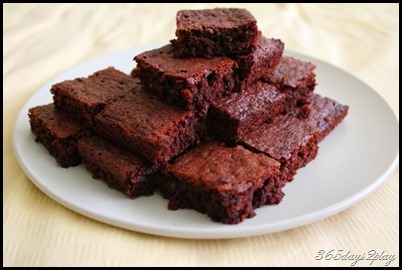 Dump it into your brownie pan and bake for 20 minutes! What could be easier? Read on for the recipe…. The Partner wanted to have ramen for his birthday lunch some weeks back and suggested Ippudo at Mandarin Hotel. So we went there again, our 2nd time. This time round, there wasn’t much of a queue even though we arrived smack during lunch time. We had almost decided not to go because the last time we went at 11.45am and managed to get the last free table before it became full. Ippudo is one of those ramen places that specialise only in ramen. So if you don’t like ramen, or don’t like their style of ramen, you are pretty much in for a not so enjoyable time. The menu is just 1 laminated piece of paper. The noodles are basically the same, the difference is in the soup broth. I forget the name of the one we prefer but it is the $15 one halfway down the menu. The soup is really delicious and flavourful and the noodles are so bouncy you want to just keep chewing and chewing them. There isn’t much meat in the soup, only about 1 slice of pork? On the whole, I don’t know how Ippudo and other ramen stores can charge so much for a bowl of broth with noodles in them. Would you pay $15 for soup? I suppose you just have to pay that to get your ramen fix because most other places are also charging about the same. The best deal out there that I know of is at Tom Ton, where their black pig ramen is $13 and you get about 5 strips of pork. We also asked for the complementary garlic and they gave us a dish of nearly 10 cloves of raw garlic plus a garlic press! After the initial shock (I suppose this is the norm in Japan? ), we dutifully squished the garlic into our broths. One or 2 cloves is enough for the average person, but being greedy, I squished half the garlic into my spoon and slurped it down with the broth that was in the spoon. It was a big mistake. It travelled down and I could feel it burning in my stomach! It was quite painful but yet pleasurably tasty, if that is possible. The simple garlic really gives an extra kick to the soup so you must ask for it if you’re there!